If “collaboration” is the answer, what’s the question? Drucker pointed out in 1999 the requirements for improving knowledge-based productivity are “almost the exact opposite of what is needed to increase the productivity of the manual worker.” and yet we continue to think that this kind of work can be managed and improved in the same ways: look at the task and analyse it into constituent “motions” then apply some logic to the way these motions are carried out and the tools used to perform them. By doing so you can increase the amount of product you output for the labour and materials that you input. It’s been obvious for a long time that this doesn’t quite work when your job is writing copy for a website or managing a complex investment portfolio or the overall task is “customer service” but we keep plugging away with the only tool we know, only slowly feeling more and more frustrated that we can’t do things better. It’s not as black and white as this, but I think it’s important to recognise that we’re still in the early days of experimentation with what really works. Drucker’s thinking on this boils down to the ideas that we need to ask “What is the task?” – it’s not a given; that workers need autonomy to manage themselves; that continuous innovation is imperative and is also the responsibility of workers themselves; the requirement for continuous learning and teaching; and moving to see that quality of output is at least as important as quantity in any talk of productivity. This autonomy and responsibility for self-management, innovation and learning activities is also not something that we can do in isolation without the help of others. That’s where collaboration comes in. How can we do it better? What is getting in the way and how could we eliminate that? What can I teach others? What do I need to learn to be better at my job? How can we as a team improve the quality of our work? What cool stuff do you do “outside work” that could shine light on our shared work? 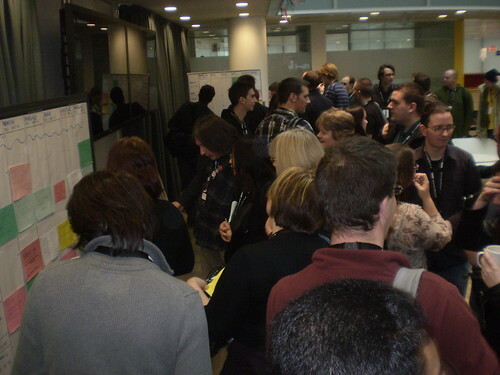 The process of tackling these questions together is well-tested in the space between organisations where there is some common goal: the barcamp (a better web), all flavours of GovCamp (better government) and Devoted & Disgruntled (better theatre). Talk at Tuttle has turned of late to how to do this within large organisations, for teams or divisions who have a large enough group to merit paying for help with talking this stuff through. Previous PostBlog Club: Six things I hate about HeadlinesNext PostWriting Exercise… and cars!